WARRANDYTE’S senior football sides will start the 2014 EFL season with some confidence after showing some great signs of improvement in two recent practice matches. A disappointing end to the 2013 season saw the Bloods relegated after finishing last in Division 3, however some good early form is promising for a strong year. Practice matches against Templestowe and Latrobe University provided an important opportunity for new and established players to gel as a unit and put into practice set-ups learned over a long preseason. 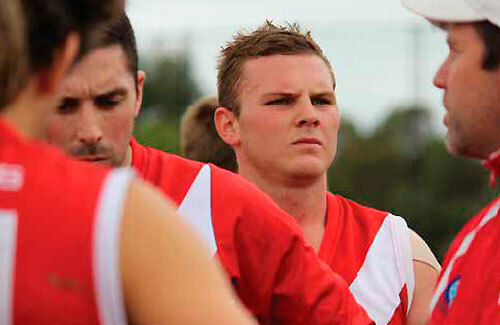 Coach Michael Tout has returned at the helm this year after a stint at Donvale. “We were very rusty against Templestowe and turned the footy over too much, however we showed some encouraging signs,” said Tout last week at the season launch. Tout highlighted some new Bloods to keep an eye on for 2014, including Stephen Harris, Jacob Daley, Trent Parker and Kyle Sultana. “The aim for the season is clear,” Tout says. Warrandyte’s first match was away against Silvan after the Diary went to print. Find out more at the club’s website www.warrandytefc.com. Pictured Above: Michael Morello and new recruit Josh Barrett listen intently to coach Michael Tout during a recent practice match.